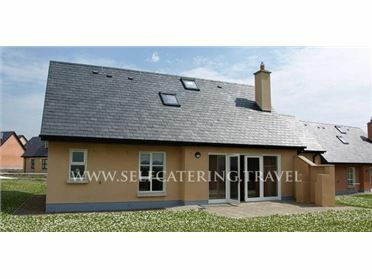 Stunning self-catering home located in perhaps the most beautiful and certainly the most exclusive area on the Ring of Kerry, just 400 yards away from the beauty of Oysterbed harbour. Standing in a sheltered and private garden, this single storey luxury holiday home is built on a large scale with nearly 3000sq feet of ground floor space, and surrounded on all sides with a deck which is delightful to use for entertaining in the summer. Oysterbed lodge is a Post & Beam house features soaring cathedral ceilings in the main reception room, which opens on to the dining area and kitchen, with all the fittings you would expect in a luxury home. The kitchen has all the usual high quality appliances including a microwave, ceramic hob and double oven, large stainless steel fridge and freezer, dishwasher and a really good collection of top quality cutlery, glasses for all occasions, crockery, and virtually all the cooking equipment you could possibly need. The interior is really spacious and open plan, with stunning open vaulted ceilings in the main reception rooms, and the furnishings are contemporary. The open plan reception rooms are on a massive scale and the house is flooded with sunlight which streams through the vast floor to ceiling windows. There is a well stocked library in the Snug. The light and airy master bedroom has a large walk in closet and an en-suite bathroom with a cast iron bath tub and a large walk in power shower. Guest room 1 has twin beds and a walk-in dressing room, with a bathroom off the hallway comprising of power shower and a three piece suite. The second guest suite has a king size double bed, as well as an en-suite bathroom with limestone floors and walls, a walk-in power shower, and a bath. All bathrooms have under-floor heating and Perrin & Rowe taps.